The recommended native data format for ArcGIS stored and managed in a relational database A collection of various types of GIS datasets held in a file system folder. This is the recommended native data format for ArcGIS stored and managed in a file system folder. Original data format for ArcGIS geodatabases stored and managed in Microsoft Access data files. This is limited in size and tied to the Windows operating system. Single user and small workgroups. Many readers or one writer per feature dataset, stand-alone feature class, or table. Concurrent use of any specific file eventually degrades for large numbers of readers. Single user and small workgroups with smaller datasets. Some readers and one writer. Concurrent use eventually degrades for large numbers of readers. Each dataset is a separate file on disk. A file geodatabase is a file folder that holds its dataset files. Up to DBMS limits One TB for each dataset. Each file geodatabase can hold many datasets. The 1 TB limit can be raised to 256 TB for extremely large image datasets. Each feature class can scale up to hundreds of millions of vector features per dataset. Two GB per Access database. Effective limit before performance degrades is typically between 250 and 500 MB per Access database file. Versioning Support Fully supported across all DBMSs; includes cross-database replication, updates using checkout and check-in, and historical archiving Only supported as a geodatabase for clients who post updates using checkout and check-in and as a client to which updates can be sent using one-way replication. Only supported as a geodatabase for clients who post updates using checkout and check-in and as a client to which updates can be sent using one-way replication. File system management. Windows file system management. ArcSDE for all other DBMSs included with ArcGIS Server for enterprises Allows you to optionally store data in a read-only compressed format to reduce storage requirements. Often used as an attribute table manager (via Microsoft Access). Users like the string handling for text attributes. File and personal geodatabases, which are freely available to all users of ArcView, ArcEditor, and ArcInfo, are designed to support the full information model of the geodatabase. This includes topologies, raster catalogs, network datasets, terrain datasets, address locators, and so on. File and personal geodatabases are designed to be edited by a single user and do not support geodatabase versioning. With a file geodatabase, it is possible to have more than one editor at the same time, provided they are editing in different feature datasets, stand-alone feature classes, or tables. Use an efficient data structure that is optimized for performance and storage. File geodatabases use about one third of the feature geometry storage required by shapefiles and personal geodatabases. File geodatabases also allow users to compress vector data to a read-only format to reduce storage requirements even further. Personal geodatabases have been used in ArcGIS since their initial release in Version 8.0 and have used the Microsoft Access data file structure (the .mdb file). They support geodatabases that are limited in size to 2 GB or less. However, the effective database size is smaller, somewhere between 250 and 500 MB, before the database performance starts to slow down. Personal geodatabases are also only supported on the Microsoft Windows operating system. Users like the table operations they can perform using Microsoft Access on personal geodatabases. Many users really like the text handling capabilities in Microsoft Access for working with attribute values. ArcGIS will continue to support personal geodatabases for numerous purposes. However, in most cases, we recommend using file geodatabases for their scalability in size, significantly faster performance, and cross-platform use. The file geodatabase is ideal for working with file-based datasets for GIS projects, for personal use, and for use in small workgroups. It has strong performance and scales well to hold extremely large data volumes without requiring the use of a DBMS. Plus, it is portable across operating systems. When you need a large multiuser geodatabase that can be edited and used simultaneously by many users, the ArcSDE geodatabase provides a good solution. It adds the ability to manage a shared, multiuser geodatabase as well as support for a number of critical version-based GIS workflows. The ability to leverage your organization's enterprise relational databases is a key advantage of the ArcSDE geodatabase. Through many large geodatabase implementations, it has been found that DBMSs are efficient at moving in and out of tables the type of large binary objects required for GIS data. In addition, GIS database sizes and the number of supported users can be much larger than with file-based GIS datasets. The ArcSDE geodatabase supports the management and updates for these and many other data management scenarios in a multiuser environment by using a method called versioning. Versioning is a mechanism in which all database changes are recorded as rows in tables. For example, each time you update a value in a row, the old row is "retired" and a new, updated row is added. NOTE: This mechanism for maintaining records of all changes along with their metadata is the genesis of the term versioning. ArcSDE uses metadata about versions to isolate multiple edit sessions, support complex transactions, share replicas, synchronize contents across multiple databases, perform automatic archiving, and support historical queries. In the past, ArcSDE was sold as a separate ESRI product. Starting with ArcGIS 9.2, ArcSDE technology has been included as capabilities within ArcGIS rather than being offered as a separate product. ArcSDE technology has been integrated into ArcGIS Desktop, ArcGIS Engine, and ArcGIS Server so that users can scale their DBMS-based geodatabases across their organizations. 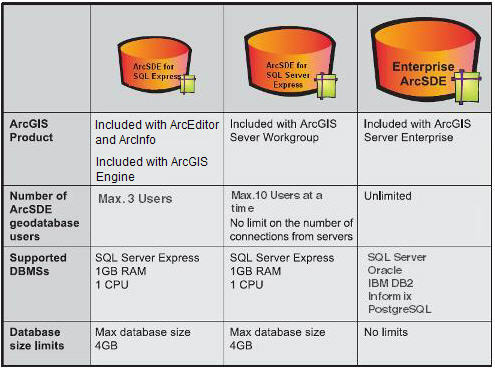 Beginning at ArcGIS 9.2, ArcEditor and ArcInfo have included the Microsoft SQL Server Express database free of charge. These software products also include ArcSDE capabilities to support ArcSDE geodatabases in SQL Server Express for up to three simultaneous desktop users. Beginning with ArcGIS 9.3, ArcGIS Engine includes support for SQL Server Express free of charge. The optional Geodatabase Update extension for ArcGIS Engine is required for ArcGIS Engine applications that edit geodatabases. You can learn more about ArcGIS Engine in the book named What is ArcGIS 9.3? Microsoft limits the use of SQL Server Express to one CPU (or Core within a Socket) and to utilize 1 GB of RAM. The maximum database size for SQL Server Express is limited to 4 GB. Within ArcEditor and ArcInfo, the ArcCatalog application provides the ability for you to fully administer and manage ArcSDE geodatabases using SQL Server Express. This provides full ArcSDE geodatabase capabilities for up to a few users at a time. You set up and manage these ArcSDE geodatabases within ArcCatalog. No extra software or database administration expertise is required. For the workgroup server, you can use ArcEditor or ArcInfo to create, administer, and manage ArcSDE geodatabases for SQL Server Express within ArcCatalog. No extra database administration expertise is required. You do not need to monitor and manage the use of your memory and CPUs for SQL Server Express. The SQL Server Express software will automatically limit computer use to 1 GB RAM on a single CPU and to a database size of 4 GB. Unlike the Microsoft Access database, SQL Server Express performance does not degrade as the database size approaches its maximum size limit (4 GB). ArcSDE for SQL Server Express is included free as a part of ArcEditor and ArcInfo. If you choose to install SQL Server Express, you can administer SQL Server Express databases using ArcCatalog. When you install ArcGIS Server for Workgroups, you can install and use SQL Server Express and ArcSDE. After installing SQL Server Express, you can use ArcCatalog in your ArcEditor or ArcInfo seat to administer SQL Server Express databases for your Workgroup server. These various levels enable users to take full advantage of ArcSDE geodatabases for any number of users, large or small. This allows organizations to have one scalable data architecture that works across their single-user systems up into their large enterprise systems.